Bardo AF’s mission is simple: shrink the world. Fluent in Spanish and Portuguese, Bardo spent much of his childhood living abroad in Italy, Spain and Japan. His global lens allows him to not only rap and sing in multiple languages, but also draw inspiration from places outside the US. 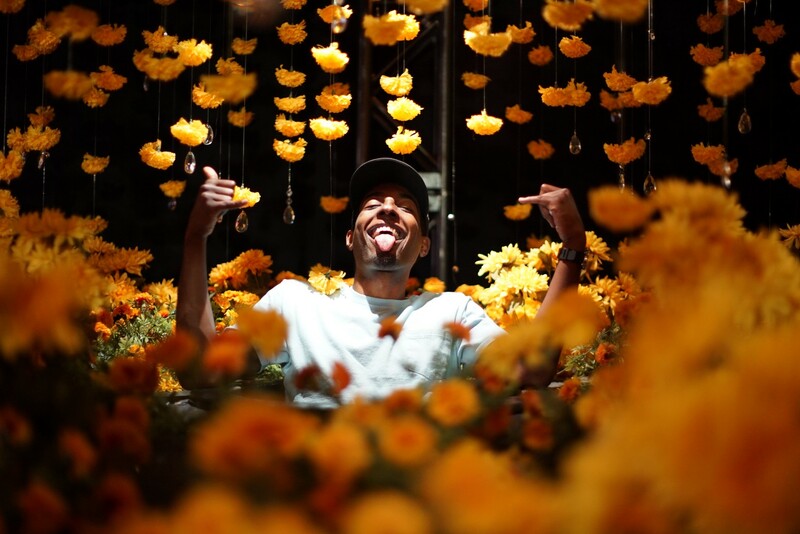 Bardo hopes that his Chicago-bred, groovy sound, (provided by his four-piece band Allied Forces) which has been compared to Outkast and N.E.R.D, can help knock down the barriers and ignorance that exists between different people and places simply by providing contact and a common groove. Here is a highlight of our interview and time spent together. Thank you so much for joining us! Let’s show everyone you’re a normal human being. What are your hobbies, favorite places to visit, pet peeves? Tell us about YOU when you’re not at the office. “My top hobby is traveling for sure. What it does for me spiritually and the way that it allows me to challenge myself and unlock different aspects of my personality is super addicting. “Puerto Rico is my favorite place to visit. I’m hoping to go back pretty soon. Spain and Brazil are tied for a close second. I have a huge list of places that I haven’t been to that I really want to visit. Currently, Germany is pretty high on that list. “I also love videography. I edit all my music videos and do a lot of shooting. I love watching editing tutorials online and think I may be addicted to 4K drone travel videos. Drone travel videos have been a relatively new discovery for me and I’m starting to fall deep into them. “Videos, videos, videos. I’m very fortunate to have a pretty ‘in house’ setup when it comes to the creation of my visuals so I’m able to play with a lot of different ideas. On my YouTube channel we have the Groovy AF series that we started at the end of last year. “We launched our Live AF series last month, which I’m really excited about, with the amazing Chicago-based, Philly-bred artist Jordanna. It’s a series where I collab with different artists/musicians on a short song or groove and then we work in a cover or interpolation that fits with our original concept in a really cool way. So definitely stay tuned for more installments of that. “Without a doubt, I owe a ton of my success to my friend, engineer and drummer James Treichler. I was in a very confused and frustrated place when I met him, and he opened a whole new world for me. Everyone who’s ever hung out in downtown Champaign, Illinois knows James is the man. He knows everybody, and he’s connected me with so many people in the music scene both in Champaign and Chicago who have helped me see my projects through and advance on this journey. “Most importantly though, James was the first person to sit down and listen to all these crazy ideas I had in my head and not tell me no, or that it wasn’t possible. He always tries his hardest to help me bring my ideas to life or connect me with people who can, and I love him for that. “The second person is someone who I honestly can’t remember meeting, but I think she does…My mom has been there literally from day one. When we would drive to McDonald’s to get as many cup holders as they could give us so that I could put them up in my closet/vocal booth as “sound proofing”. She was the first person who told me that what I was making was good. She’s always there to give me confidence when I need it most. “At this point I can say that I’ve played a ton of shows. I can remember the feeling I had before my first-ever live show like it was yesterday. I’m naturally a pretty low-key person so the idea of standing in front of a bunch of people and singing songs was not only insane to me but super scary. The thing that got me through was telling myself that if I could make it through this first one, it would only get easier. “I was right, and the feeling of accomplishment and near invincibility that I felt from conquering one of my biggest fears at that time became addicting. It allowed me to embrace new challenges with a confidence that I didn’t have prior to that first show in front of seven people at Bar 10 Doors. “Since then, I’ve played a lot of big shows and a lot of unorthodox shows in weird places with weird crowds, but I’ve always been excited and taken each show head-on because I knew the experience would make me that much stronger and I knew the feeling that waited on the other side. The concept of mind over matter has been around for years. A contemporary description of this is having mental toughness. Can you give us an example (or two) of obstacles you’ve overcome by getting your mind in the right place (some might call this reframing the situation). “I practice Transcendental Meditation; not as regularly as I should, but still quite often. One of the main benefits that I notice from it is the ability to step back and pause. This has made all the difference for me. “I used to be a big-time hot head and I thought it was cool to be that way and to settle issues with aggression. But as I got older, I realized that for me, that approach tends to make situations a lot worse and drag them out much longer than they need to be. About a year ago I really started focusing on that ‘pause’ and using it to my advantage. 1. “Take notes. Really take the time to examine what got you to that place and what you could have done to avoid it. Remember how you felt in that exact moment and go back to that feeling every time you find yourself in a similar situation. 2. “Did you die? No? Alright then, you’re stronger and smarter for it. If you learn from it. “I’ve heard that having a mentor really helps with avoiding potholes along the way. I don’t have a true mentor in my profession yet, so I would say do your research. All actors or musicians have sleepless nights. We have a term we use with our clients called the “2 a.m. moment.” It’s when you’re wide awake and thinking not-so-positive thoughts about your business choices and future. Can you describe a 2 a.m. moment (or moments) you’ve had and how you overcame the challenges? “To be honest, I don’t have too many of those. If I’m up late and I can’t sleep, it’s normally because I’ve hit a creative streak or found some inspiration that won’t let me fall asleep and I’m recording or writing down ideas. Nobody likes to fail, and we sure don’t like to admit we failed. Can you describe a moment when you confided your most closely-held business issues/problems to someone close to you, and how the conversation(s) helped you work through the issue? “I actually do that all the time, so it would be tough to pick just one instance. I have a circle of about five people that I share almost everything with in terms of my business, my music and my ideas. Without them allowing me to bounce ideas and get my thoughts out of my own head, I would be so frustrated and would not be able to continue to pivot and try new things, which is the only way that I know how to move past failures and something that I pride myself on being able to do. “Lots of videos and visual content. I’m also working on a new album. Keep that low though, haha. Also, be on the lookout for new Allied Forces merch coming really soon! You can follow me @whereisbardo on IG and Twitter. AFTillDeath on Youtube and Facebook.com/bardoaf. My latest album Gringo is available on iTunes and all streaming platforms so make sure you check that out and follow my artist page, so you don’t miss out on any of the new releases! Drew Gurley is an entrepreneur with a focus on connecting bright minds, customer experience, and motivating behavioral change. He's an active member of the Forbes Finance Council and has been interviewing and connecting with CEOs, Actors, Musicians, Entrepreneurs, and Peak Performers to better share their stories.